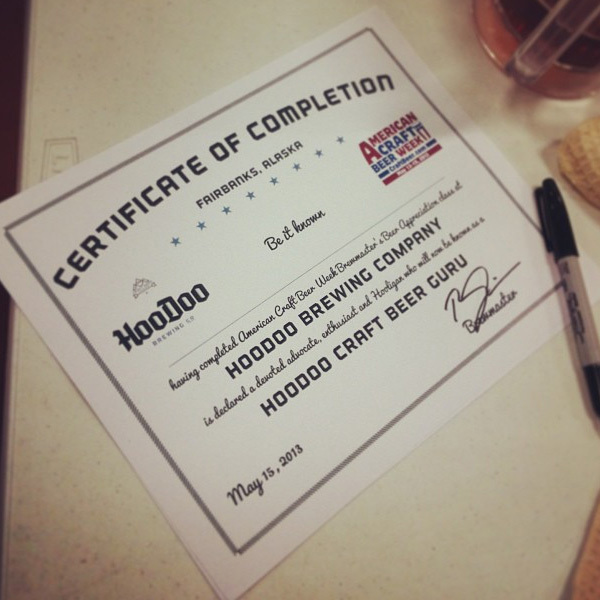 You are here: Home / Brew Log / Celebrate American Craft Beer Week at HooDoo! ACBW provides an opportunity for small and independent brewers, craft beer enthusiasts and their community to celebrate the ever advancing beer culture here in the U.S.
We are excited to announce our involvement in American Craft Beer Week, 7 days designated to celebrate delicious craft beer produced by small, independent breweries. American Craft Beer Week runs from Monday May 12 through Sunday May 18, 2014. During American Craft Beer Week, Fairbanks beer drinkers can expect fun events to expand Fairbanks’ craft beer culture through education, collaboration, cooperation, and responsible libation. “Craft Beer Week is all about the beer and it’s an opportunity for everyone to come together and recognize what breweries and local providers bring to the community through their craft and passion,” adds Karen Wilken, who helps HooDoo with marketing and events. This year will feature the release of HooDoo’s 2014 Maibock Lager and a limited release Maibock t-shirt and poster produced in collaboration with artist Lucas Elliot. Also, people can sign up for beer appreciation classes with Bobby, enjoy an All-American Vinyl Tuesday with Retrograde Media’s Brady Gross, and participate in a toast that will be read simultaneously with all the other participating breweries across the country. There will also be specials on beer flights as well: $6 for four 4oz tasters and $10 for four 8oz beers. 6pm: HooDoo Limerick Contest begins on Facebook. 5 winners will be chosen on Wednesday and invited to read their limerick in the taproom on Thursday, May 15. The crowd will decide an overall winner for grand prize. 6pm: Instagram contest begins: How Do You Celebrate American Craft Beer Week? Tag #HooDooACBW in your Instagram posts. Each day, one photo will be chosen for “Fan Instagram of the Day” and shared, so get creative! 5 overall winners will be chosen on Sunday, May 18 for HooDoo swag. 3 – 8pm: All-American Vinyl Tuesday. Guest DJ Brady Gross, of Retrograde Media, will spin an All-American set to kick off ACBW 2014. 5pm: New Release Keg Tapping – Maibock, a Bavarian strong, golden lager. Limited Edition Maibock T-shirts and posters featuring a design by local artist Lucas Elliot will be available for sale after the Maibock is tapped. 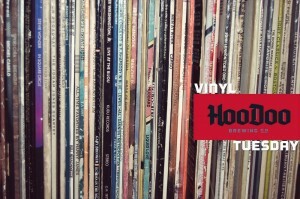 In these classes, Bobby will sample attendees on HooDoo’s craft, giving an in depth teaching about each style, origins, ingredients and brewing techniques. Discussions about common flavors and tasting beer will be included. $20, includes a take-home tasting glass. Limit 20 people each class. Reservation recommended by calling 459-BEER or registering in the taproom. 4pm: ACBW National Toast (8 pm ET/5 pm PT/4pm AKST). Patrons are encouraged to come early to read a group toast. 6pm: Second Annual HooDoo ACBW Limerick Contest winners reading in the taproom. Of the five winning limericks that were submitted, the crowd will decide the overall winner. 11am – 8pm, ongoing throughout the day: Tours of the brew processes. 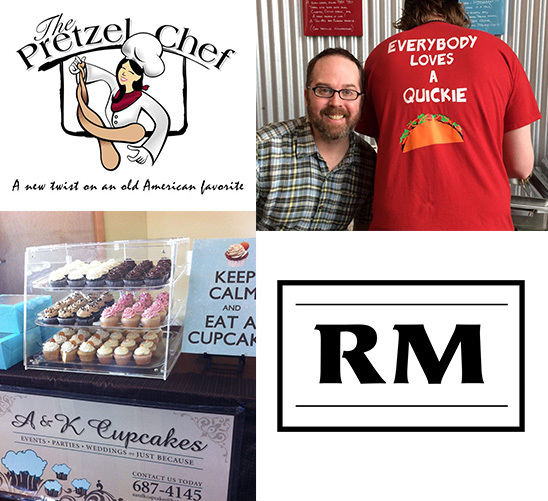 Thank you to the local businesses that are participating!